I have trouble with storage, and with organising. I have hoarding tendencies, and tend to fill every nook and cranny with stuff. Which then makes it hard to find things when I need them. I think for the things that are important to you, and important that you be able to get to them, you find a way. Mission: to find a way that works. I’ve struggled with storage for my shoe and boot collection for some time and have been thinking about solutions. Some I’ve found over the past few days may help you too. Purge, ladies, purge! It really will make it easier to find the ones you’ve got. If they’re broken/waiting to be repaired and it’s been 6 months or more – let em go. If they’re uncomfortable, tight, too loose, have just never fit – let em go. If you have multiple pairs of the same type of shoe, and you only wear one or two – let some go. If you’ve changed your style and no longer wear certain footwear you used to – let em go. 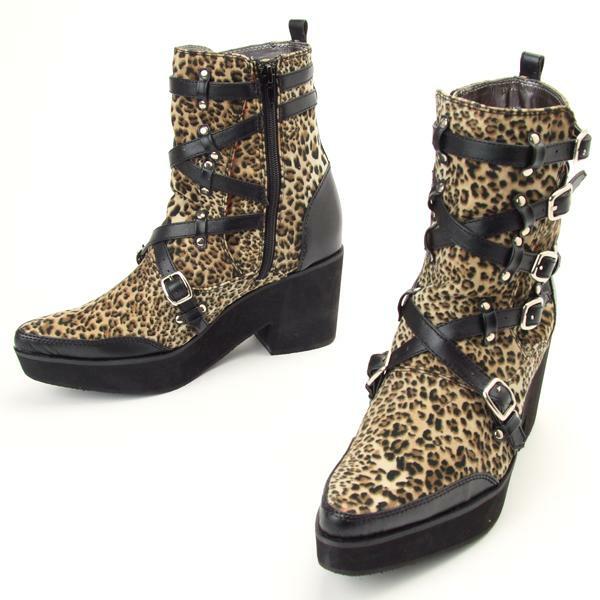 (I suppose there may come a day when I don’t wear platforms…and weeping, I’ll throw out at least half my collection). I ended up throwing 5 pairs of shoes out. Some were broken – I had to realise I would never get them fixed. Some were just old and scuffed, and even if they held happy memories of when I wore them as my tap shoes when I played Bonnie in Anything Goes back in 1995, there is a time to say buh-bye. And how many Mary Janes do I need? There are still a few that are stylish and in good nick that are a bit small, that I will either give to friends or sell on ebay. 2. Look for storage space. Find a place in your home that suits you, and which is large enough to house your collection. Actually walk around your home and look for options/possible wasted spaces. There just wasn’t room in my bedroom and wardrobe, and they’d keep spilling out all over the floor, tripping up my poor hubby when going to bed. And making it a nightmare to find the right pair when I needed them. I realised the shoe rack needed to be visible and accessible. 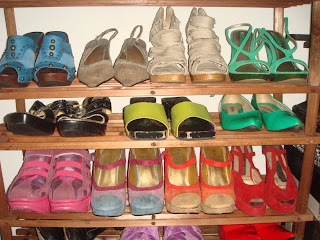 If you only wear a few different pairs of shoes, then just under the bed may work fine. But I wear lots of different ones. We’re used to thinking of certain spaces must be used for certain things. Maybe the bedroom isn’t the best place for YOU. Maybe you have current storage options that you’re using for something else. It could be a bookshelf that currently houses books. It might be the oven, if you don’t cook (channelling Carrie Bradshaw here). If you get rid of old appliances/furniture etc you’ve “been meaning to throw out” you might find the space for your glorious shoes. You could even use the back of a door (or several doors) and use those canvas hanging racks. I was looking at my deep shelving unit in the spare room that currently held my hats, hat blocks, millinery and craft books and asssorted crafty materials. 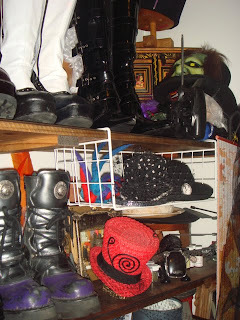 I realised that if I could move a lot of that stuff elsewhere, the shelves were high enough to store my boots, without them being folded over. GREAT! Do you have a shelving unit or bookcase that could be used in this way? 4. When enough isn’t enough. Maybe you’ve already figured out what works for you, but it’s not quite big enough. Add to it. 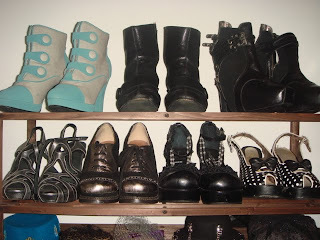 I had a few paltry levels to my shoe rack that just weren’t cutting it. I went out today to my local shopping centre and bought more wooden shoe racks ($8.99 each at Go Lo). I assembled them, and now the rack stands about the same height as me! 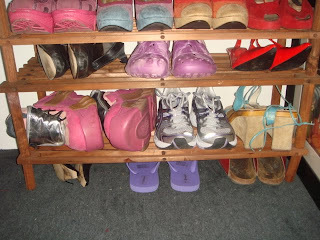 I used the spaces between rows to store shoes as well – the flat shoes worked just fine as is, and other pairs I just turned sideways. 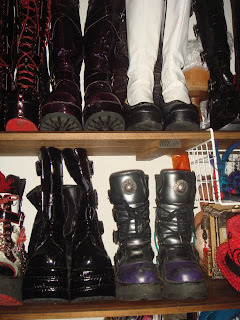 On the shelving unit, the shelves were deep enough that I could put the boots 2 deep. I can still see the boots behind so I won’t forget they’re there. 5. Make it look pretty, as well as functional. 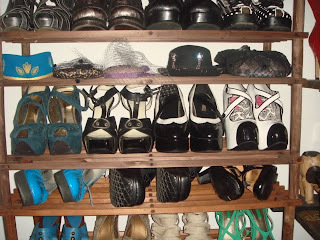 Both from a visual and organisational perspective, I decided to group the shoes in certain ways. I kept the biggest platform shoes together, kept the black or black and white together, metallics together, and kept similar colours together. Sporty shoes, espadrilles, summer flip flop sandals, went to the bottom. 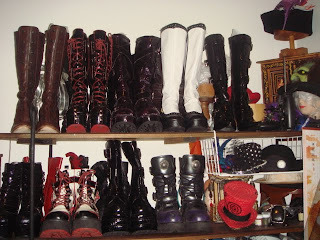 The boots on the deep shelves, I put the ankle and calf boots together, and the knee high ones on the top shelf. I suppose some pictures are in order, eh? Well, here they come…. 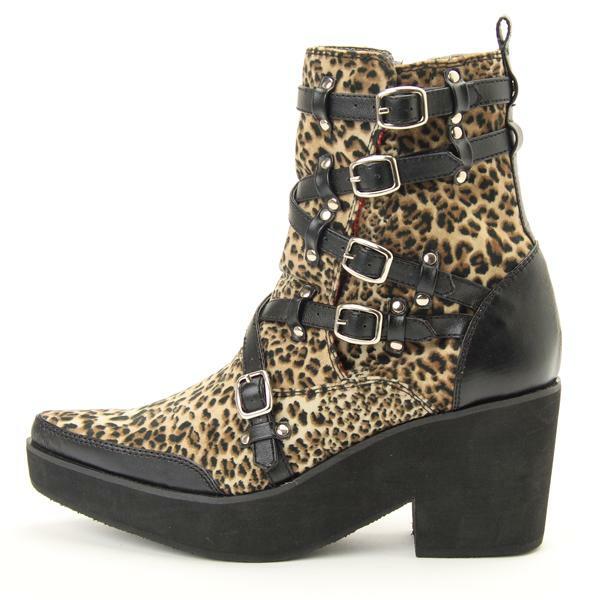 And the boots on shelves, firstly overall..
And now left to right. So now, even if the rest of the flat is disorganised, and even if the rest of my life is disorganised, at least my shoes aren’t. 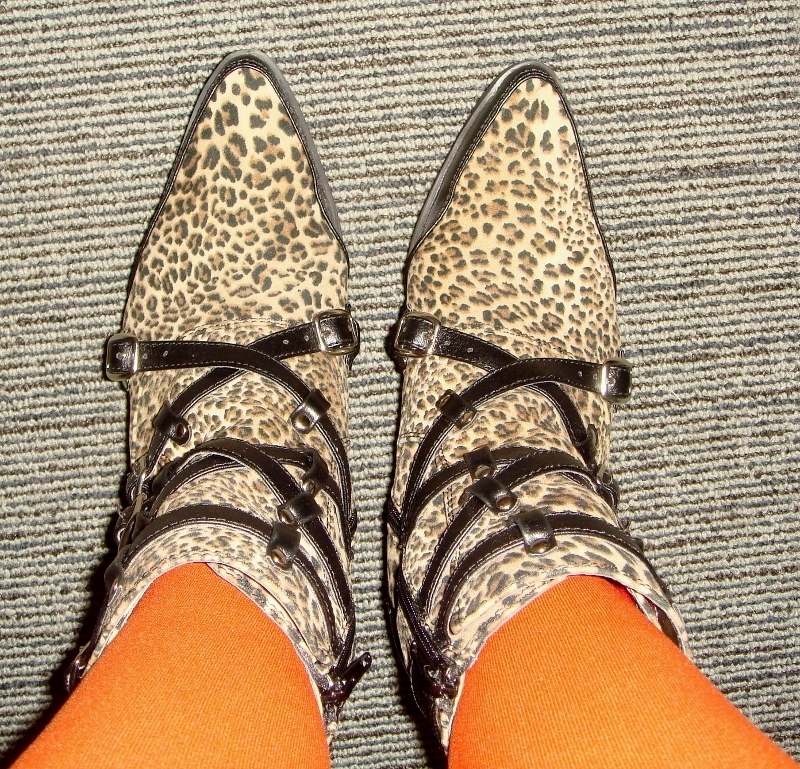 Next on the agenda…polishing the scuffed ones, and taking a few to the bootmaker to be reheeled. So that suits me for now. How do you store your shoe collection? In shoeboxes with polaroids, like some stylists do? Under the bed or in the wardrobe, wherever they’re thrown? In those over-the-back-of-the-door canvas holders perhaps? Or in a row by the door (if you live alone). What works for you? 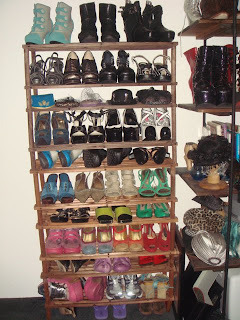 The shoe racks I used are the timber ones, seen on this page from Lasoo. Howards Storage World (which I LOVE) have these canvas ones for the wardrobe. There’s a plethora of shoe storage options at Global Market. My Shoe Storage has a shoe wheel!!! very different, and has a Rakkido version which is fun for kids. Pink Lily does clear shoe boxes too, and an entire wardrobe kit! 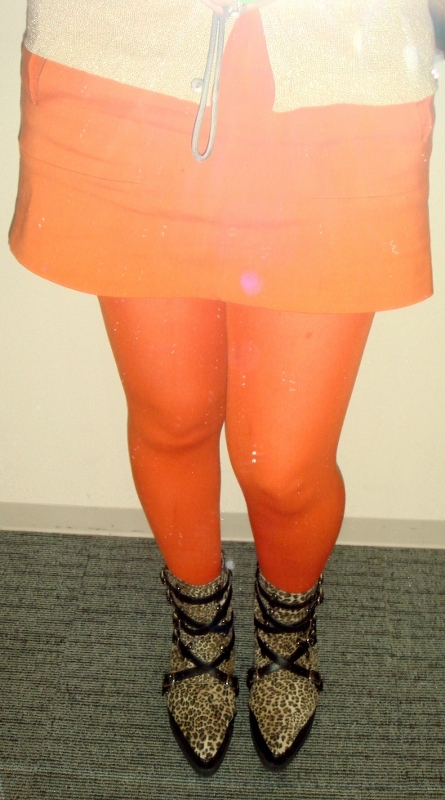 Lisanne Oliver has a blog with great tips, a webstore and some fab before-and-afters. Organising Tips is the blog of Organising Queen, Marcia Francois. Howards Storage World has this video on an organised bedroom. 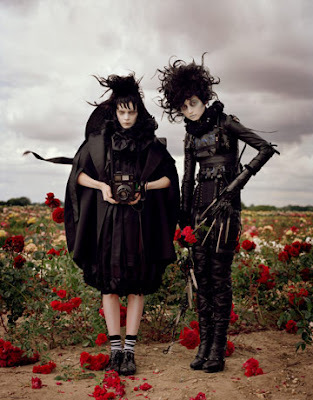 Most of us in the alternative/goth community LOVE Tim Burton, as do a helluva lot of other people. We love the fantasy element that isn’t sickly sweet but dark and ominous, which reminds us that humans are a complex and twisted bunch. Or as the Doors, and Echo & the Bunnymen put it, “People Are Strange”. Exciting news for people in the US is the Tim Burton exhibition at MOMA . (Old news, I know, but I want to keep my TB links all here in one place 🙂 From November 22 to April 26, a major Tim Burton career retrospective is happening – and it’s certainly made me think seriously about jumping on a plane to go see it! Just one amazing image from the shoot. Tonight I’m heading off to a performance of “The Surgical Sideshow“, which is a theatrical piece inspired by Tim Burton, and featuring creatures called “Skellingtons”.